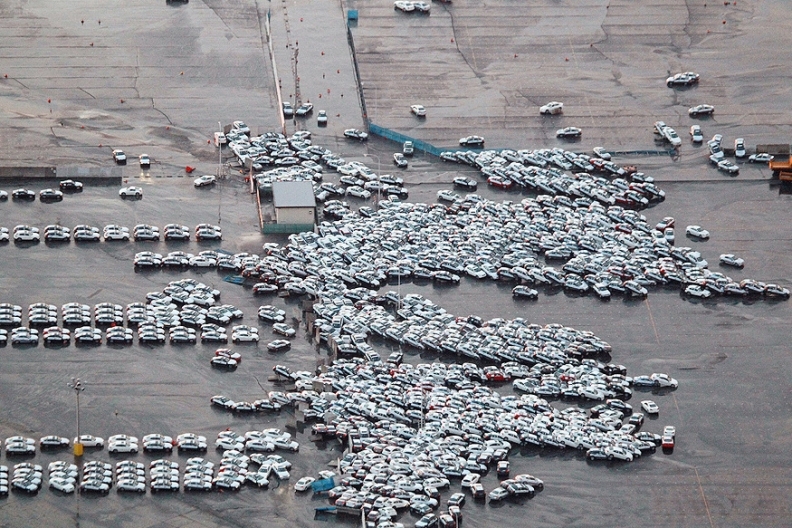 Thousands of Nissan and Infiniti models were destroyed when Friday's tsunami hit the Port of Hitachi. TOKYO – The earthquake-triggered tsunami that ravaged Japan's Pacific coast has damaged at least 2,300 Nissan and Infiniti brand vehicles awaiting shipment to U.S. and Japan showrooms. The cars – including nearly 1,300 Infiniti M, EX and FX models bound for North America – were parked at two coastal loading points when the giant waves swept through. Pictures of the carnage at one of the points, the Port of Hitachi in Ibaraki prefecture, show hundreds of brand new Nissan and Infiniti vehicles piled on top of one another and scattered like toy cars. Television footage later showed many of the Infiniti models engulfed in fire. About 1,300 cars – all to be exported to the United States – were damaged at the Port of Hitachi. Most were Infiniti nameplates such as the M sedan and EX and FX crossovers. But the damaged cars also included a small number of 370Z sports cars, the company said. Those cars are made at Nissan's Infiniti assembly plant in nearby Tochigi prefecture. A service center in neighboring Miyagi prefecture, where cars were being assembled for shipment to domestic dealers, was likewise devastated by the tsunami. About 1,000 vehicles were damaged at that location. Nissan Motor Co. confirmed that many of the vehicles at the Port of Hitachi had been consumed by fire. It couldn't give an exact breakdown or identify the cause of the fire. Fires were widespread throughout much of the disaster zone following Friday's killer 8.9-magnitude earthquake. The quake and the tsunami waves it triggered, ruptured gas lines, wiped out villages, devastated ports and wharfs, damaged nuclear power plants and flooded vast areas. Nissan, Toyota, Honda and Subaru were among the automakers suspending production. Because public transportation was shutdown, about 1,500 employees at Nissan plants and offices in the quake area spent the night on-site. Most were expected to return home Saturday. By Saturday afternoon, there had been no reports of serious injuries among Nissan employees. "Bottom line – we are happy no one is hurt. We can build new cars," said Andy Palmer, whose promotion to Nissan executive vice president in charge of corporate and product planning was announced just two hours before the earthquake hit. Nissan said it would suspend operations on Monday at all five production plants nationwide, including its plant in Kyushu in the far southeast of the country, far from the quakes epicenter. It will decide whether to resume production Tuesday after assessing the damage. In response to a request from the city of Yokohama, where Nissan has its global headquarters, the company opened its head office to the public and sheltered about 150 people there the night after the quake, Nissan said.